On a break from blockbusters, Tom Hiddleston used 2016 to take on roles in smaller films. Despite Hiddleston’s good performance, the Hank Williams biopic I Saw the Light fizzled – will High-Rise fare better? Based on JG Ballard’s novel, High-Rise takes us to London circa the 1970s, where we meet Dr. Robert Laing (Hiddleston). He becomes the newest resident of a 40-story high-rise apartment complex, one that establishes him as a mover and shaker in society. Alas, this prominent status won’t last. Problems start to befall the building, and these stir unrest among the residents – especially those on the complex’s lower floors, as they think they get fewer benefits than those on upper levels. This gradually leads to a degradation in the local civilization and challenges for Laing and the others. High-Rise tips its ending early, as the opening shots show Laing and the building in “post-apocalyptic” splendor. Before the movie flashes back three months, it lets us know the story won’t come with a happy ending. This seems like spoiler territory to some degree, as I’m not sure the story benefits from its decision to reveal the severe deterioration of society we will witness. Might it be better to let us start with Laing on top and see the decline without foreknowledge? Maybe – though most prospective viewers will already know the path the tale will take. The trailer and the Blu-ray’s case reveal this, so we know it will occur. Still, I think a little more mystery might work better, especially because so much of High-Rise wallows in misery. It doesn’t take especially long before matters start to go off the rails, and an awful lot of the movie focuses on the squalor and degradation among the tower’s residents. High-Rise would’ve benefited from additional character exploration, as it leaves us with thin participants who feel like little more than archetypes. Some are especially obvious, like the creator of the building. With the last name “Royal” and his title as “the architect”, he gets placed as a blatant God-like figure, right down to the heavenly white garb he wears. Because the movie tears through the basic set-up so quickly, the film feels like it loses a lot of character areas. The movie seems rushed and lacks a coherent through-line, which makes it somewhat muddled. In particular, High-Rise loses points due to its not-especially-creative social commentary. The movie provides easy, simplistic symbolism such as the choice to make the upper and lower classes literal. We get far too many forced metaphors, as High-Rise prefers its broad themes over concise storytelling and logic. Much of the story requires a lot of suspension of disbelief, such as the reason the inhabitants stay in the tower. Society hasn’t collapsed – it’s just the building that degenerates, so why stay? To create more of those stretched metaphors, I guess. In the disc’s extras, we hear mention that many regarded the source novel as unfilmable, and given the result, I tend to agree. The kind of symbolism on display can work in the written context, but the more literal nature of cinema creates problems that the filmmakers can’t overcome. Parts of High-Rise work well, as the flick maintains an effectively moody and melodramatic feel. It also comes with strong acting, especially from Luke Evans, as he brings a lively energy to his part. Unfortunately, its heavy-handed imagery and general lack of coherence harm it. These factor make High-Rise a less than compelling tale. 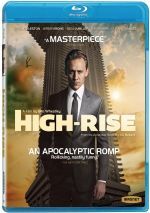 High-Rise appears in an aspect ratio of approximately 2.39:1 on this Blu-Ray Disc. The movie came with a largely good presentation. Overall sharpness seemed satisfying. Interiors could appear a bit tentative at times, but the majority of the film displayed positive delineation. I saw no shimmering or jaggies, and edge haloes remained absent. Print defects also failed to mar the proceedings. Given the movie’s 1970s setting, should you expect a “period palette”? Nope - High-Rise went with a heavy orange and teal tint so typical of modern movies. 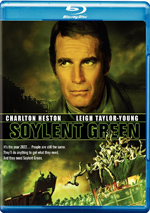 The colors seemed unimaginative but the Blu-ray reproduced them well. Blacks appeared dark and tight, and low-light shots offered good clarity. This was a satisfactory transfer. I also felt pleased with the film’s DTS-HD MA 5.1 soundtrack, though it lacked a ton of ambition. The soundscape largely stayed with environmental information, though various scenes added some involvement to the proceedings. A party made good use of the various channels, and a few other sequences delivered reasonable activity as well. Audio quality satisfied. Music was rich and lush, while effects seemed accurate and well-defined. Speech appeared concise and natural, with no edginess or other issues. The soundtrack suited the movie. The disc includes an audio commentary with director Ben Wheatley, producer Jeremy Thomas and actor Tom Hiddleston. All three sit together for a running, screen-specific look at the novel and its adaptation, the movie’s path to the screen, story/characters, cast and performances, sets, locations and visual design, camerawork and editing, music, and other insights. Pretty much everything about this commentary works. It gives us a deep look at the film and delivers a lot of nice thoughts. Even happy talk remains minimal, so this turns into a lively, informative chat. Four featurettes follow. Building the World of High-Rise goes for nine minutes, two seconds and includes comments from Wheatley, costume designer Odile Dicks-Mireaux and production designer Mark Tildesley. “World” looks at set design and costumes. The show offers a smattering of good insights. During the three-minute, 36-second Heady Special Effects, we hear from special effects artist Dan Martin. He tells us about the fake human head used in the film for a medical examination. Some disgusting visuals ensue, but the short reel tells us the details involved. Breaking Down High-Rise and Its Tenants fills 14 minutes, 50 seconds with info from Hiddleston and actors Elisabeth Moss, Dan Renton, Jeremy Irons, Keeley Hawes, Sienna Miller, James Purevoy, Sienna Guillory and Luke Evans. “Tenants” covers cast and characters. It provides a perfunctory overview. Finally, Bringing Ballard to the Big Screen lasts three minutes, 58 seconds and features Hiddleston, Miller, Evans, Thomas, Wheatley, Tildesley, Irons, and authors Ned Beaumann and Travis Elborough. “Screen” presents a short look at the adaptation of the source. It throws out a couple of worthwhile thoughts but lacks much substance. The disc opens with ads for The Wave, Gridlocked, The Ones Below and The Last King. We also find a trailer for High-Rise. Visually inventive and well-acted, High-Rise comes with potential. However, it suffers from over the top metaphors and a dearth of vivid storytelling, factors that make it frustrating. The Blu-ray presents good picture and audio as well as a reasonable selection of supplements. Parts of the film thrive but too much of it tries too hard.